A donation of land from Vidler Water Company fills a gap between the trail on the perimeter of Empire Ranch Golf Course, and Riverview Park, making the trail route available all the way from Mexican Dam to Deer Run Road. The Board of Supervisors accepted the donation yesterday at the board meeting. The last remaining link will be a bridge over Eagle Valley Creek, which will take some time to accomplish with necessary design and then grant funding. 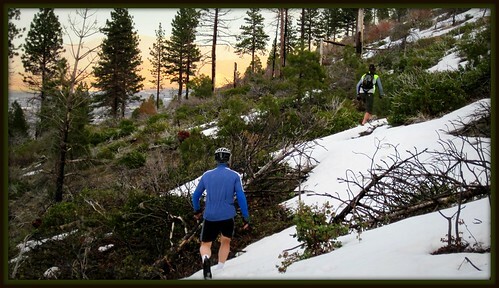 Muscle Powered has always supported completion of this trail, as well as extensions up and down river, and with the network of trails in and around Carson City. See the Nevada Appeal article. On the agenda for (discussion-only ) this Tuesday is the efforts by Muscle Powered to construct and maintain trails in the Ash Canyon area. Tuesday, May 4th at 5:30 p.m. in the Sierra Room at the Carson City Community Center. The Ash/Kings Canyon Trail project has picked up momentum recently with invaluable assistance from Chas Macquarie, Jeff Moser, Howard Riedl, Janice Brod, Toby Welborn, and Lester Fitzhenry. Though we’ve seen recent success with the Open Space Committee unanimously voting in support of funding the necessary environmental study (which is required before we can build trail on Forest Service land), our advocacy efforts are far from over. A big selling point that we’re employing to convince our city managers that this is a cost effective project (besides quality of life and economic benefits), is that the mountain bike community is stepping up to the plate to construct the trails with volunteer labor. This is where you, the Bike Carson reader, come in. The large turnout we had at the Open Space meeting April 19th didn’t go unnoticed and we need your help again. Though the agenda item is for discussion-only, a strong show of support from the mountain bike community would demonstrate that we’re serious about our trails. 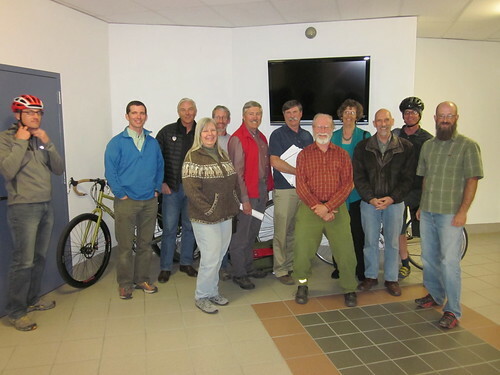 Muscle Powered and other members of the bicycle community attended the Carson City Regional Transportation Commission meeting on April 14th to present the Bicycle Friendly Community plan. Mark Kimbrough, Executive Director of the Tahoe Rim Trail Association and member of the State Bicycle Advisory Board, presented the BFC plan to the commission, and Ty Polastri, president of the Lake Tahoe Bicycle Coalition, shared his insight of how South Lake Tahoe made its entry into the Bicycle Friendly community. Ty was instrumental in South Lake Tahoe receiving a Bronze award from the League of American Bicyclists, and he has been helping Carson City along on our path to becoming the first Bicycle Friendly Community in Nevada. Not only would becoming a Bicycle Friendly Community lead us in the direction of having a nice and safe city to walk and bike in, Ty and Mark both conveyed how BFC status relates to bicycle tourism and economic prosperity. Not only is it a quality of life issue, it’s a public relations campaign. Your city may be a cycling Mecca, but if you don’t advertise it, who will know? An official BFC status will put Carson City on the national map, and has the potential to attract tourism and people and businesses looking to relocate. 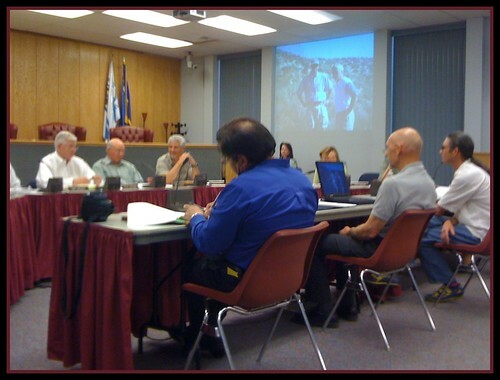 The Carson City Regional Transportation Commission voted to adopt the action plan for a Bicycle Friendly Community, and Mayor Bob Crowell had great things to share about his experience while visiting the Bicycle Friendly Community of Tempe, AZ. The next step is to move on to the Board of Supervisors and begin the long application process with the League of American Bicyclists. Complimenting the Bicycle Friendly Community project is the Ash Canyon to Kings Canyon trail project. 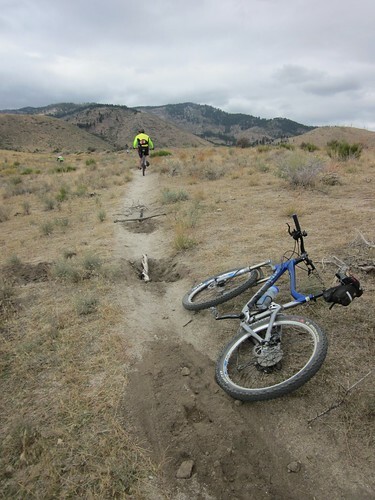 Mountain Biking and hiking on the west side of Carson City is growing in popularity. Not only are we seeing more locals hit the trails, people from the Carson Valley, Reno, Lake Tahoe, and Truckee are making the trip down to Carson City to experience what Carson City has to offer. As good as our trails are though, we’re going to need more miles of trail before we can attract visitors from further away. On April 19th, Muscle Powered’s Chas Macquarie and Jeff Potter presented the Kings Canyon to Ash Canyon trail plan to the Open Space Advisory Committee. The proposed trail will connect the top of the Creek Trail to the switch back area of Kings Canyon road, traverse the the scenic high ridges above the Kings Canyon waterfall area, and add an addition 5 miles of trail. This trail would provide connection to future trails in the Borda Meadows area, including the already existing Longview Trail. And going beyond this area, the goal is to tie into the Carson Valley trail network, the Tahoe Rim Trail, and Marlette lake Flume Trail. As you can imagine, we would then have a trail system to brag about. Jeff Potter had presented his trail plan to the Forest Service a couple years ago, but with little city or community backing, the plan never made it onto the Forest Service program list. This meeting with the Open Space Committee, however, was much different. Using the momentum we gained with progress in the Bicycle Friendly Community area, Chas Macquarie made a compelling presentation of our master trail plan to the committee. Backing Chas and Jeff up was a room full of trail users. Almost every seat was filled! Selling the plan to the committee was not a challenge, since many of them use these same trails themselves. The biggest hurdle to get the project going is an environmental assessment of the proposed area. These are not cheap at around $60K-70K. The committee was not opposed to funding this though, and will put this item to vote at the next meeting. There are also grants available to reimburse these fees down the road. In the end, the Open Space Advisory Committee voted and approved the efforts of Muscle Powered to pursue this trail project. If everything falls into place, trail construction would most likely begin on the north end of the trail in Ash Canyon, since the city currently owns this property. A strong community and city government backing will bring us much more influence now when we go back to the U.S. Forest Service and ask to build trail on their portion of the land. Carson City. Future Mountain Bike Mecca? 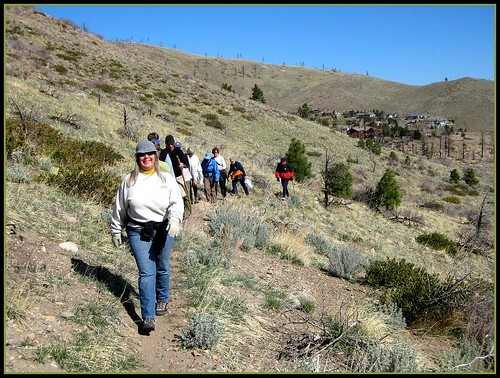 A big part of the reason this project is being allowed to move forward is that much of the work to construct and maintain this trail will be provided by the volunteer work of Muscle Powered, an advocacy group of citizens for a walkable and bikeable Carson City. In this economy, volunteer work is a powerful tool, since many government agencies and departments have no money left in their budgets to take on anything new. In fact, many are scaling back. It’s very uplifting to see that bicycle advocacy issues are now bringing more people to city meetings, and believe me, this participation is making a huge difference, but to have an even greater influence with city, state, and federal goverment, we need to grow the Muscle Powered membership. Annual dues to join Muscle Powered are only $10 for student/senior, $15 for an individual, or $20 for a family. Not only does membership with Muscle Powered allow you to participate in Muscle Powered exclusive events like walks and bicycle rides, memberships and donations provide the primary source of funding for Muscle Powered projects. Muscle Powered has a downloadable membership form on the website. Very soon we’ll have our Paypal service available on the website as well, so you can make easy and secure electronic payments. You will also notice you can now subscribe to the Muscle Powered newsletter using the link at the top right sidebar. Please consider attending the Open Space Committee meeting this Monday, April 19th if you would like to show your support for existing and future mountain bike trails. 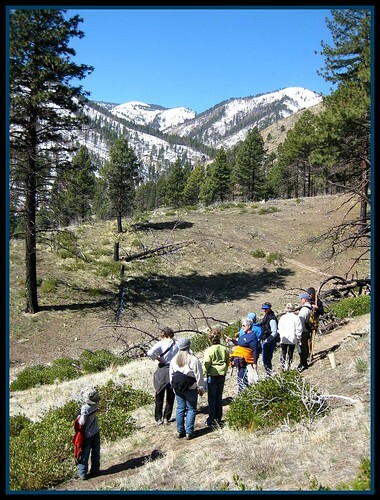 The meeting is in the Sierra Room at the Carson City Community Center and starts at 6:00 p.m.
We will present our Kings Canyon to Ash Canyon Trail plan, and ask for approval to start construction on the section of the trail which is managed by Carson City. 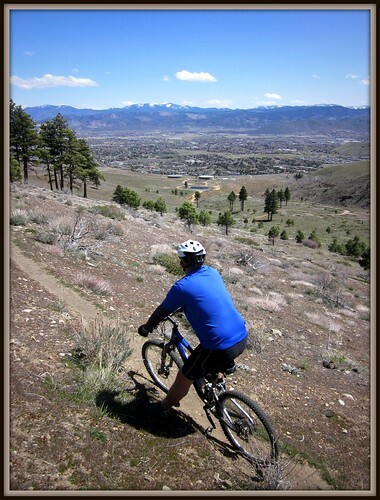 By attending this meeting you will demonstrate to the Open Space Committee that building new mountain bike trails should be a priority for Carson City. Chas Macquarie provided this update on the potential freeway bicycle trail. As most people familiar with the Freeway Trail saga know, NDOT was forced to design and construct a multiuse trail on Phase 1 of the freeway from Silver Oak Dr. (formerly Broadleaf) to Hwy 50. However, there are sections that are bike lanes on two streets – Retail Court and Russell Way adjacent to the new Boys and Girls Club. As part of the deal the City cut with NDOT, NDOT is not required to construct a trail on subsequent phases of the freeway, though they did construct the east-west link that connects the linear ditch trail to Butti Way where it joins up with the trail the City paved on the south side of 5th Street. 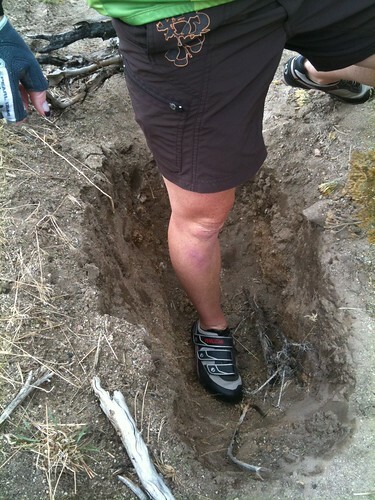 So there is now a good east-west trail across Carson City east of Roop Street. NDOT also agreed to design the freeway so that it did not preclude the future addition of a trail “to the extent practicable”. 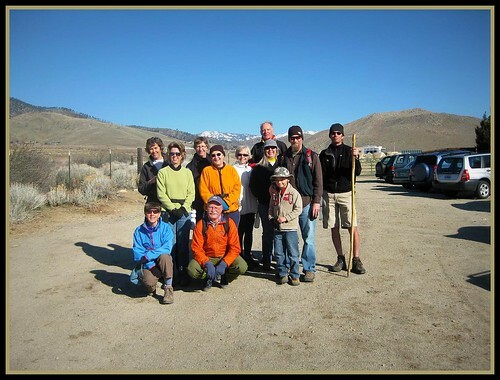 On April 4th, Muscle Powered board members got together to hike the Ash Canyon trail network. A few friends came along too, including Kerstin Wolle, president of the Carson Valley Trails Association. Earlier in the year, Muscle Powered attended the CVTA annual meeting, a presentation showcasing the wonderful trail network they have built in the Jobs Peak area. We were inspired at the number of attendees at the meeting. It was standing room only, the building full of enthusiastic supporters for trails in the Carson Valley. On the way home we decided we needed to do something like this in Carson City, and wondered if Muscle Powered would be the ones to do it. After much discussion between the Muscle Powered board members, we had a meeting with Carson City Parks and Recreation and Mark Kimbrough from the Tahoe Rim Trail Association. We explored the possibilities of Muscle Powered branching out to become a trails organization. Mark shared his trail building wisdom, and Parks and Recreation was excited about the idea of forming a trails partnership with Muscle Powered. 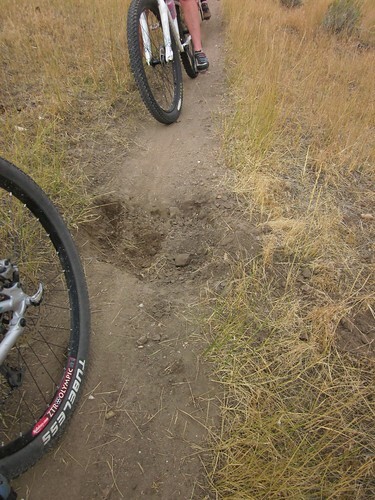 The plan would be to start off simple; adopt an existing trail and maintain it. 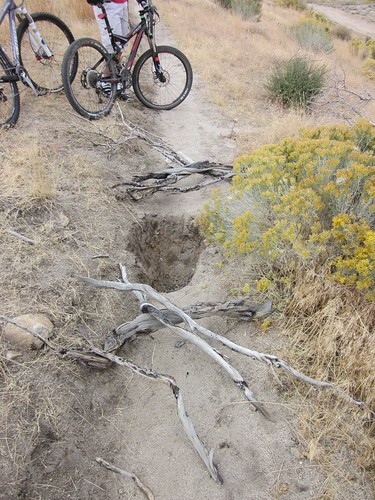 The sites are currently set on portions of the Ash Canyon trails that are on city land. Saturday’s hike was a great opportunity to present the trail to all the Muscle Powered board members, and meet a few new friends. 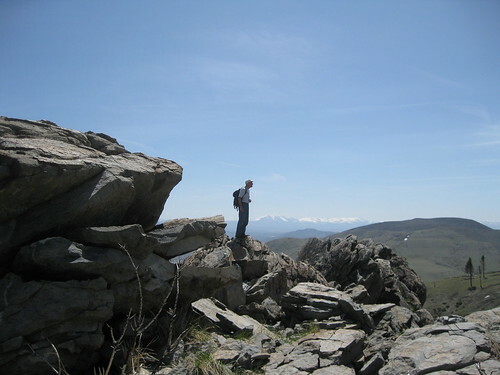 The blue sky offered great views of the snow capped mountains, and signs of spring were everywhere. Green grass, flowers, new buds on the trees, and a swift running Ash Canyon Creek. Normally I ride this loop on my bicycle, but it was nice to walk the trail for a change. My son came along, and he had a great time. The loop trail we did was the perfect length for a family outing. Much still needs to be done, and many things would need to fall into place for Muscle Powered to adopt a trail, but we’re off to a good start. Stay tuned for further developments. More pictures from the hike can be found HERE.